Displaying data from Google Analytics, Adwords and Adsense beyond the scope of our pre-built integrations with these services. If your Adwords and Adsense accounts are linked to Google Analytics, you can use this method to receive data from these services (and Google Analytics) into Google Sheets and from there to Geckoboard. See Linking Analytics and Adsence and Linking Analytics and Adwords for more info. We have pre-built integrations with Google Analytics, Adwords and Adsense. However, it's possible that you need to display very specific data that is not yet supported by these integrations or that you want to aggregate data before displaying it on your dashboard. 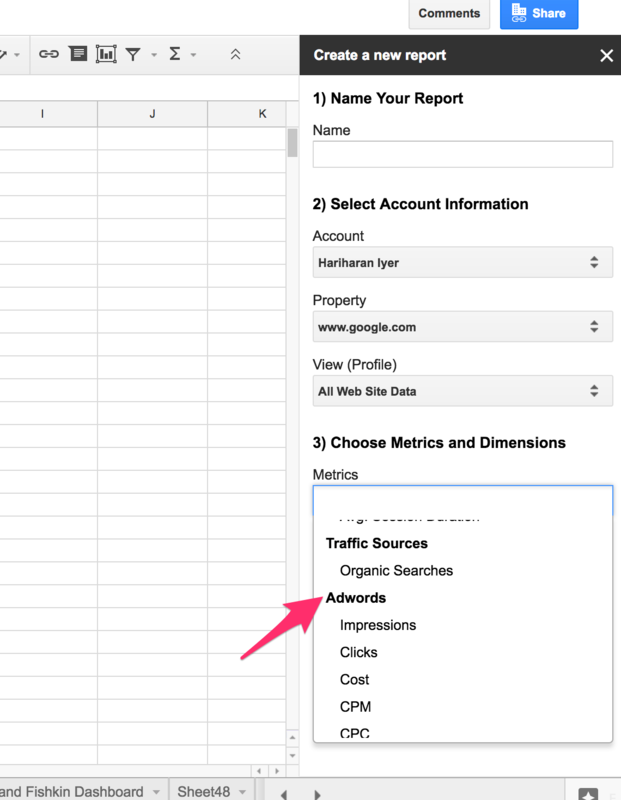 Conveniently, the team at Google have built a handy tool to pull Google Analytics, Adwords and Adsense data straight into Google Sheets, where you can manipulate it to your heart’s content in the familiar surroundings of a spreadsheet. This approach can also be used to manipulate the data or create combinational metrics using data from these sources before pulling it into your Geckoboard via our Spreadsheets integration. Simply go to this link: https://chrome.google.com/webstore/detail/google-analytics/fefimfimnhjjkomigakinmjileehfopp Then install the add-on by hitting the blue +FREE button in the top right-hand corner. This will then install the add-on and ask you to connect your Google Analytics account before opening a new Google Sheet for you to get started. Once you’ve installed the add-on and the Google Sheet has opened, hit Add-ons > Google Analytics > Create new report to get started. From this basic setup screen you specify the account, property and view that you want to pull data from. You can then select the metrics you’re interested in, and any dimensions that you’d like them broken down by.